In many ways, my world is a small one. It isn't broad or grand or glamorous, really. Most days I wear a familiar routine, worn in places from use, and I think it suits me well. I have an affection for that sameness; I am loyal to it and and it is reliable in its service. There is a luxury in contentedness that I have come to appreciate. Fo us, that contentment with the regular is what prepares us for the extraordinary - good or bad. The security in knowing that the familiar will always be around gives us firm footing for standing up to hold close or defend against the happenings of the world beyond. 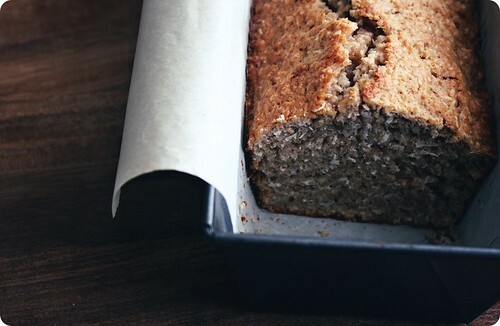 This undemanding coconut bread from Bill Granger is as trusty as trusted can be. We've been making this recipe for years, a recipe famous already and without need of my seal of approval as it has already been decorated by far grander folk. Nonetheless, I thought I'd bring it out in the chance that you might not have heard of it before, and for those who have, to remind you of its strong points. If you have ever wanted to eat macaroons for breakfast, but felt the need for an excuse to do so. Here's you go, here it is. This bread is coconut through and through, a buttery base barely holds together that coconut in a texture that is moist and toothsome, like the centre of a Bounty bar in bread form. Even better, this is a useful bread to have around. For the earlier-mentioned breakfast, toast it until crisp at the edges and serve with butter and marmalades, or save it for afternoon tea and serve it with a veil of confectioner's sugar sifted over its crust, or pack away blocky slices in the freezer where they won't mind the cold one bit. It's also a bread that welcomes variation, one takes citrus beautifully (into the wet ingredients whisk in the zest of your choice, lime or grapefruit is especially nice). Or, if citrus isn't your thing, finely-chopped candied ginger or chocolate chips folded into the batter with the butter also make a top-notch additions. There is nothing difficult about the recipe itself; in the matter of the ingredients or the method. It's made up of baking staples, simply stirred together wet into dry, in the muffin method - meaning just barely, so that all the liquid is absorbed and the flour is dampened and incorporated, but no more than that. No whipping or creaming required. In truth, anything that athletic is frowned upon, since overworking the batter will result in a firmer bread than is our aim. Lethargy wins the day. As it should. So go forth, with sturdy slices tucked into your pockets or squirreled away for when they're needed. Come rain or shine, regular or remarkable, whatever the day brings you can be happy in the knowledge that there's coconut bread waiting for you. Adapted slightly from the original. In a small bowl, whisk together the eggs, milk and vanilla seeds. Set aside. In a large bowl, sift together the flour, baking powder, cinnamon and salt. Stir in the sugar and coconut. Make a well in the centre of the dry ingredients, and slowly add the egg mixture, stirring until just combined. Fold in the melted butter, being careful not to overmix. Grease and flour a 8-by-4-inch loaf pan. Pour in the batter and bake in the preheated oven until the loaf is golden and a cake tester inserted into the middle comes out clean, around 1 hour. Remove from the oven and allow to cool in its tin for 5 minutes, then turn it out onto a wire rack. Position it again side up to cool a bit more. Slice thickly and toast, or serve as is. A smear of butter or a dusting of confectioner's sugar is optional, but either would be a really good idea. Grapefruit marmalade would be exceptional. 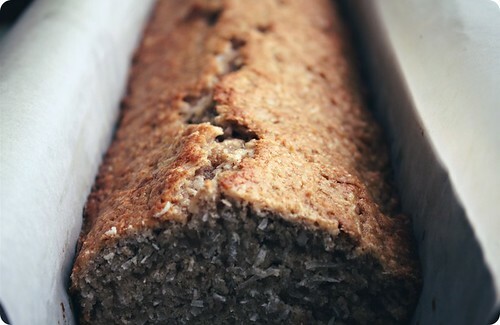 • I had the urge to make this one day, and found that I only had a few ounces of each sweetened, flaked coconut and unsweetened, finely shredded coconut. I tossed them together equal parts of the two to get my full amount and haven't looked back since. It's not a necessary change, but worthy of note. • If you do not have fresh vanilla beans on hand, 1 teaspoon of vanilla extract can be substituted. • The crust on this bread is something special; it has the crunch and lacy feel of the golden edge of a macaroon. To encourage a higher crust-to-middle ratio, I bake mine in a long and narrow loaf pan, it is 10-by-3 1/2-inches - in that case, I use a sling of parchment paper to make it easier to remove. This batter also makes pleasantly-dense cakelets when baked in a muffin tin.